The Fellowship was fortunate enough to obtain a copy of TOYBOX TIME MACHINE from IDW Publishing. The book is written and illustrated by Marty Baumann. Travel back in time and wonder what would have happened if these magnificent toys had actually come out! From Holly Thorne, Agent of M.O.D., to the U-Boat Hunter Search and Destroy, to the very scary Reflect-o Masks, it’s all here (and only here) in this catalog! Mr. Baumann captures the fun, wacky, imaginative spirit of the toys (and ads) of the 1950s and 1960s. The attention he pays is SO detailed; right down to the logos of the non-existing companies look like they belong in that time period. The ad graphics look like they just came out of a comic book or magazine, and they are perfect. This book does not lie when it claims “a catalog of the coolest toys never made.” I wish they have been made and are available now! I’d buy them. Check it out and either relive your childhood or wish this had been a part of your childhood. 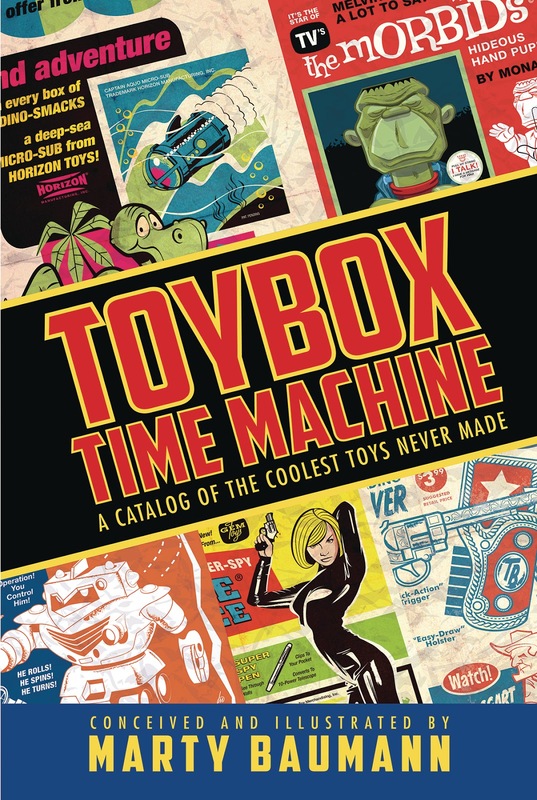 TOYBOX TIME MACHINE is in stores now or available at www.idwpublishing.com.